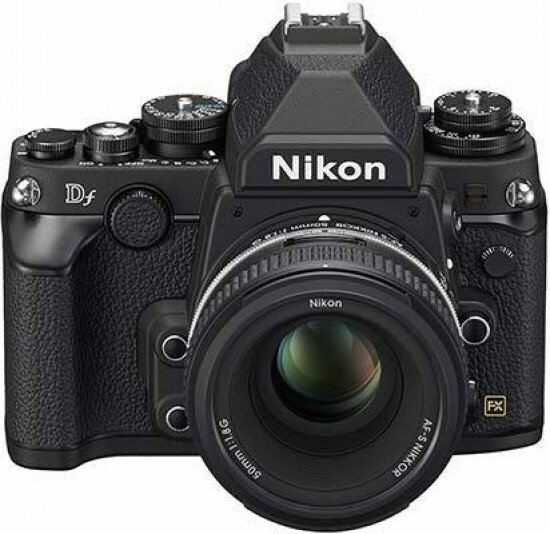 The Nikon Df is a retro-styled full-frame DSLR camera that's inspired by Nikon's iconic 35mm film cameras. The Nikon Df has the same 16.2-megapixel FX-format CMOS sensor and EXPEED 3 processor found in Nikon's professional flagship camera, the D4. Other highlights include elegant mechanical dials, a 39-point AF system, 3.2-inch 921k-dot LCD monitor, a sensitvity range of ISO 50-204,800, compatibility with non-Ai (pre-Ai) lenses, continuous shooting at 5.5fps, a self-cleaning sensor unit and a shutter tested to 150,000 releases, maximum shutter speed of 1/4,000th sec, flash synchronisation at up to 1/200th sec, 1,400 shot battery life, and a pentaprism finder with 0.7x magnification and 100% coverage. Available in black or silver, the Nikon Df costs £2749.99 / $2999.95 / €3350.00 including a special edition AF-S Nikkor 50mm f/1.8G lens. In the USA it's also available body only for $2749.95. From the front the Nikon Df is a striking camera, boasting a retro design that we think will appeal to old and new Nikon users alike, especially when the matching special edition silver-banded 50mm lens is fitted. Nikon have obviously spent a lot of time and attention on getting the aesthetics of the Df just right, and it's certainly paid off. 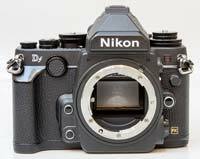 Having said that, the Nikon Df looks like any other Nikon DSLR when viewed from the rear, although as you'll spend a lot of time with the viewfinder at eye-level, that doesn't really matter too much. More importantly, from a style point of view, the overall design suffers when you fit other Nikon lenses than the 50mm kit lens, as they invariably have a gold-banded design that instantly looks out of place on the Df. The Nikon Df is the smallest and lightest 35mm full-frame DSLR camerain Nikon's current range, just pipping the D610. The overall body ergonomics and the weight distribution of the camera are very good, feeling perfectly balanced and very much like a natural extension of your hands, and we certainly appreciated the weight saving when using the camera for more than a couple of hours. 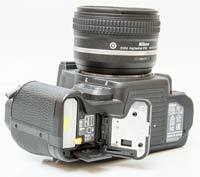 The lower weight has mainly to do with the body material - the Nikon Df has a body shell whose rear, bottom and top plates are made of metal but the front plate is plastic. That doesn't make it any less sturdy - in fact, the Df boasts the exact same level of weatherproofing as the D800/E. One thing we aren't so keen on is the very shallow and quite short handgrip, which doesn't provide enough support for comfortable use if using the camera for an extended period of time. With no matching vertical grip available, we suggest that you definitely try the Df before you buy. The Nikon Df has a two-position (AF-M) focus mode selector on the front with a small button at its hub. With the selector switch in the 'AF' position, you can toggle between AF-S and AF-C modes by holding down this button and turning the rear control wheel. To cycle through the available AF Area modes - single and auto area in AF-S, single, 9-, 21- and 51-point dynamic, 3D tracking and auto area in AF-C - you need to use the front command dial instead. The settings are displayed in the viewfinder and the rear LCD screen. Unless you've set the AF Area mode to 'auto area,' you can change the active AF point via the eight-way controller. Also located on the front of the Nikon Df are a Bracketing button, flash sync terminal, a Preview button for previewing how the current shutter speed, aperture, and ISO sensitivity settings affect the exposure, and a customisable Function button (which by default switches between FX and DX modes). Finally there's the standard command dial, which rather strangely sits vertically flush with the front of the camera body, rather than horizontally, and is therefore more awkward to use than might be expected. 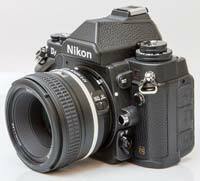 At the creative heart of the Nikon Df are five mechanical dials located on the camera's top-plate. Starting from the left when viewing the Df from the rear, we find the ISO Speed (L1-H4) and Exposure Compensation (+-3EV) dials, the latter sitting on top of the former. The Exposure Compensation dial has a lockable pin at its centre, whilst the ISO Speed dial has one located a few mms away at the 7 o'clock position. While its easy to operate the Exposure Compensation dial with one hand, we found it nigh on impossible to do the same with the ISO Speed dial, even when holding the camera at arm's length, which slows down operation somewhat. Also note that the ISO Speed dial only has settings for the H1 and H4 expanded values, so you can only assign two of the four fastest ISO speeds to this physical dial, and that you can onl;y set the ISO speed via the dial, not in the main menu system. Despite the inclusion of the new ISO Speed dial, the Df still retains intelligent auto ISO control. With auto ISO enabled, you can have the camera determine the minimum shutter speed based on the focal length of the lens in use. This means that the camera may raise the ISO sensitivity if the shutter speed drops below 1/200 second when using a 200mm lens but leave it unchanged down to 1/50 second if a 50mm lens is attached (this can be fine-tuned by the user). The setting on the ISO Speed dial essentially acts as the minimum ISO speed. Moving to the other side of the flash hotshoe, the Shutter Speed dial sits on top of the Release Mode switch. Once again, the Shutter Speed dial has a centrally located locking pin which is easy to operate with one hand. The dial has settings running from 1/4000th sec to 4 seconds, with extra B, T and X settings. There's also a 1/3 Step option if you want finer control via the main command dial. One obvious quirk to take note of is that the Shutter SPeed dial is completely redundant when you choose the Aperture-priority shooting mode. Underneath the Shutter Speed dial is the Release Mode switch. The release mode options include Single-frame, Continuous Low, Continuous High (5.5 frames per second, which is 0.5fps slower than the D610), Quiet (delays mirror return until the user lets go of the shutter release), Quiet Continuous (3fps) mode, Self-timer, and Mirror lock-up. The last of these is really only useful if you purchase the optional MC-DC2 cable release - while you can use the shutter release button in Mirror lock-up mode, the very act of pressing it can cause more vibration than the mirror itself, defeating the point. Do note however that the Remote control mode also has a “Remote mirror up” option, which you can activate via the shooting menu if you have the ML-L3 infrared remote control but not the MC-DC2 cable release. If neither is to hand, the Nikon Df offers a user configurable Exposure Delay Mode, in which the mirror is raised when you press the shutter release, and the actual exposure takes place automatically with a one-, two- or three-second delay depending on what you've set in Custom Function d10. Completing the Df's suite of mechanical controls is the pared-down mode dial, located on the right shoulder of the camera body when viewed from behind. The dial only offers 4 classic choices - P, S, A and M - with Auto or Scene modes of any kind, and no customisable U modes either (you have to dip into the Df's separate Shooting Menu Banks and Custom Settings Banks instead). The dial is locked in place by default - you have to physically pull it up and twist it to change between the shooting modes, which is a bit tricky with hands or gloves on, and especially while looking through the viewfinder. The Nikon Df has quite a small shutter release button that's threaded in the middle to fit a traditional cable release. The shutter release is then surround by a dial for turning the camera on and off, again proving a little too small and fiddly to locate in the heat of the moment. Completing the Df's top plate is possibly the smallest monochrome LCD panmel that we've ever seen on a modern DSLR, complete with its own tiny button for turning the backlight on and off. Given its diminutive size, in practice we didn't really use the panel at all. With 0.7x magnification (using a 50mm lens focussed at infinity), the Nikon Df's viewfinder image certainly isn't the biggest in the market - however, those stepping up from an APS-C model will still find it positively huge. The 100% frame coverage is a bonus, and a clear sign that Nikon has intended the Df to be a serious proposition to serious photographers. The camera only comes with a 39-point AF module - thankfully, the focus points aren't permanently marked on the focussing screen, so viewfinder clutter isn't a problem. The arrangement of the 39 focus points is identical to the D610, grouped even more tightly in the centre of the frame, offering less coverage for the off-centre areas. On a related note the AF point indicators are smaller than on any other mid-range or top-end Nikon DSLR we can think of, with the exception for the D610, meaning the active focus point is quite hard to see, even if AF point illumination is turned on via Custom Function a5. With a lower limit of -1EV, the Nikon Df's AF system is less sensitive than that of the similarly priced D800, which remains operational down to -2EV - and in our experience this does make a difference when shooting in very low light. There are also fewer cross-hatched sensors (9 in the Df versus 15 in the D800), and they are all located in the very middle of the frame. To the left of the rear screen, the Nikon Df has five buttons arranged in a vertical row. 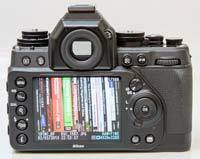 These include Menu, White Balance, Quality, Flash and Info, the middle three of which double as Help / Lock, Zoom-in (+), Zoom-out (-) buttons respectively when the camera is in Playback mode. Above these five buttons are the self-explanatory Playback and Delete buttons. Over to the right of the viewfinder are AE-L/AF-L and AF-ON buttons and a rear command dial, and below that a switch for selecting the metering mode. At the heart of the Nikon Df's live view experience is a 3.2-inch LCD screen. This is the same 921,000-dot affair found on the Nikon D800/E and D610, which incorporates a gel resin between the cover glass and the screen itself to combat the fogging that may result from sudden changes of temperature, and also makes use of an ambient light sensor to allow for automatic adjustment of the screen's brightness, contrast, gamma and colour saturation. In use we have found the screen to have excellent viewing angles but only so-so visibility in direct sunlight. As it doesn't offer video shooting, the Nikon Df just has a Live View button. As with other Live View enabled Nikon dSLRs, there is a red rectangle that you can position anywhere within the frame, so you can focus precisely on the part of your subject that you want to appear sharpest in the resulting photo. On the Nikon Df, Live View auto focus is actually pretty fast for a traditional dSLR camera, but that isn't to say it's fast in absolute terms - the latest generation of compact system cameras still run circles around it - but at least it doesn't feel sluggish. As far as manual focus is concerned, the Nikon Df has no focus peaking feature but you can at least magnify into the live view feed for accurate focusing. Another important thing to note is that you can change the lens' aperture setting while in Live View, just like the D800/E. Unlike every other Nikon digital SLR camera except the professional series (D1 through D4), the Nikon Df doesn't feature a pop-up flash. 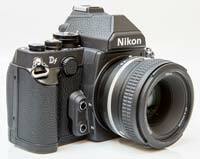 Instead the Df has a standard Nikon hot-shoe for external flashguns - but no Prontor-Compur flash sync terminal. The camera has come in for a lot of criticism for its X-sync speed of 1/200th second - on one hand it is indeed a step back from the 1/250th second sync speed of the D7100 and D800/E; on the other, it's exactly the same as that of the admittedly older Canon EOS 5D Mark III. 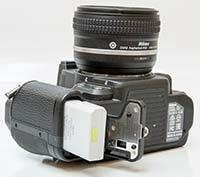 In FP mode, most Nikon Speedlights can be used at any shutter speed up to the camera's top speed of 1/4000th of a second but that of course entails a loss of flash power and range. 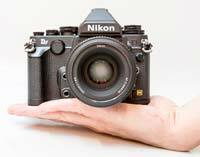 The Nikon Df inherits a few interesting features from other full-frame Nikon DSLRs. The dual-axis virtual horizon of the D800/E has found its way to the Df, which is very good new for architectural and product photographers. Also worth mentioning is the fact that just like the D800/E, D7100 and other mid-range models, the Nikon Df can auto focus with pretty much any AF lens you can mount on it, including those that do not have a built-in Silent Wave Motor, and can provide matrix metering with any AI lens including those that do not feature a CPU. Also note that F-mount lenses dating back to the 1959-1977 period can be attached to the camera even if they have not been professionally AI converted. 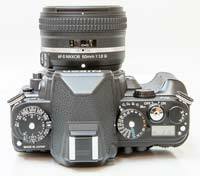 On the left hand flank, if viewing the Nikon Df from the back, we find three commendably firm, hinged rubber doors that are well-behaved enough to stay open until you close them. Sheltered behind these doors are three connection ports, including a USB 2.0 port - no USB 3.0 on the Df, unlike the D800/E - a mini HDMI connector, and an accessory terminal for the optional MC-DC2 cable release and GP-1 GPS unit. The camera is also compatible with the WU-1b Wireless Mobile Adapter. Power is supplied by the EN-EL14a lithium-ion battery which has an impressive CIPA-approved life of 1,400 shots. The Nikon Df only has a single SD memory card slot, and annoyingly it's housed in the same compartment as the battery on the base of the camera body. The shared compartment does at least have a nice lockable switch, and you can also open it when the Df is mounted on a tripod as the metal mount is positioned inline with the centre of the lens.